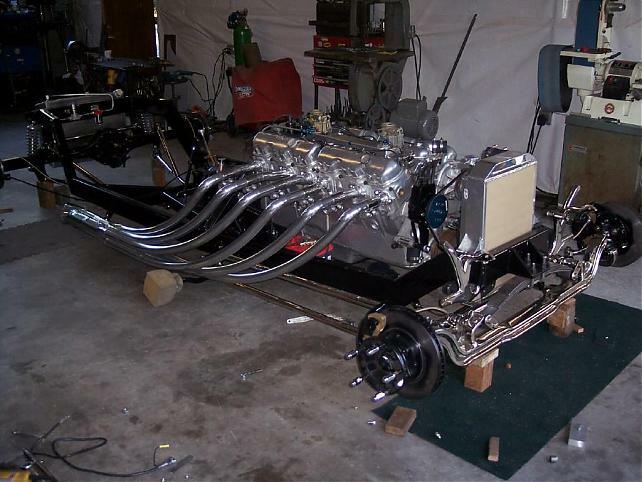 (first posted 6/30/2012) The GMC “Twin Six” 702 V12 is legendary, although it’s not really all that unusual. 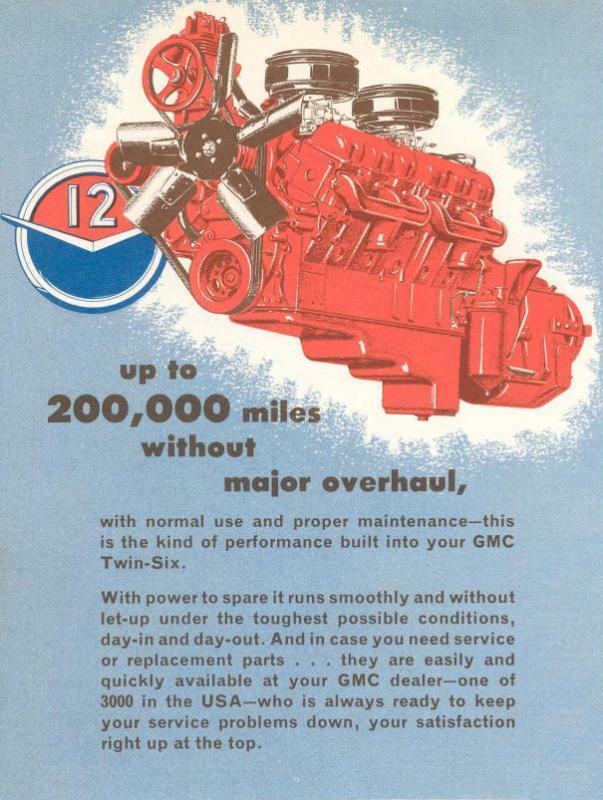 V12 truck engines were not unheard of in the US and Europe, and the GMC’s 60 degree V6 certainly lent itself to doubling up. But it’s acquired an outsized reputation, and is a cult object for certain hot-rodders and bloggers, so let’s give it its 15 minutes of CC fame. Let’s get the biggest myth out of the way first: these are not two 351 cube V6 “bolted” together. The 702 has its own block, but obviously shares many internal components as well as the V6 cylinder heads, valve covers and even intake manifolds and carbs. And although they’ve ended up in some wild rods, these engines were a gasoline-powered alternative to the DD two-stroke “Jimmy” diesels, in trucks like this “crackerbox” GMC COE. Exactly like the one that stood in front of me with a V12 badge at a red light, on old Hwy 40 outside Baltimore as I was hitch hiking, and then heard accelerating through its very many gears and straight pipes. Very memorable indeed. Although it hardly sounded like a Ferrari; the V12 had the lowest specific output of the whole V6-V12 line: 250 or 275 hp at 2400 rpm; and 585 or 630 lb.ft. of torque at 1600 rpm. That’s quite a contrast to the HD 427 Chevy V8 truck engine, which made 260 hp @ 4000 rpm, and 405 Ft. lbs. @2600 rpm. Only about 5000 of the V12s were built between 1960 and 1965, and many of them were used as stationary industrial engines, like irrigation pumps, where they ran at full (governed) throttle for weeks on end. They effectively helped kill the truly legendary Hall-Scott OHC hemi V12 engines in that role, because the GMC was drastically cheaper (I promise a full history on the Hall-Scott engines this coming winter). The 702 V12 has found its way into a number of “specials” including the Blastolene B702. Here’s the B702 chassis and engine before that fanciful body was draped over it. There’s even a company dedicated to the V12, ThunderV12. A rebuilt one starts at $10,900, if you’re thinking of upgrading your pickup. Yes, more than one has found its way under a GMC pickup hood. So, now to hear one or two. Here’s a stock one, with just a bit of throttle blipping. And here’s a ThunderV12, taken all the way to 5000 rpm, albeit very briefly. Enjoy. The only thing left: imagine if GMC had used the biggest of the V6s, the 478 Magnum, to make a V12: 956 cubic inches and some 500 hp. Thunder and Lightning V12. Goodness! I never knew these existed. There is probably not a mainstream brand that I am less informed of than GMC. I must confess an unnatural attraction to V-12 engines. I don’t know why. 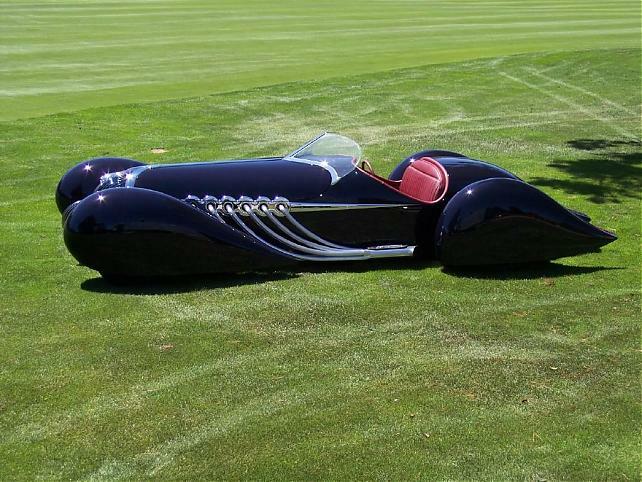 Even bad ones like the flathead Lincoln of the 1940s, or hideously expensive to own ones like the Jag or BMW. But here is a V-12 that a guy can bolt in and forget about. Just pour lots and lots of fuel through it, and watch peoples faces as they try to guess what is under the hood of the GMC pickup that I would have to put it in. 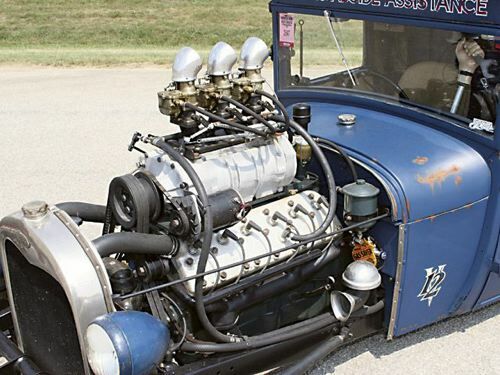 Here is a local Lincoln V12 powered rod for you. This has to be a first in the history of the world. I understood that almost everyone yanked the V12 out of their Lincolns and replaced them with Mercury V8s back in the day. I have never, ever heard of anyone putting a Lincoln V12 into a car by choice. Wow. Or, the 1949-51 Ford truck based Lincoln V-8 and Cadillac/Buick/Olds engines found their way under hoods of the classic 1940-48 Continentals. As a kid, near a friend’s house, an old guy had a cheaply-repainted metallic gold ’40 or ’41 Continental and he showed us what was under the hood – said he replaced the V-12 with a V-8 flathead from a ’49 Lincoln. Yes, it’s a direct bolt-in replacement. Order yours today! Yes, but you’d have to put the “wheelie castors” under the FRONT bumper, to keep it from tipping over onto its nose! I expect it weighs close to half of what one of the 1st Gen Miata must’ve been! to MX5BRG91: Probably not even in a trailer behind you and have you be capable of pulling it. Great writeup Paul. Must confess I haven’t seen one of these in person and thought I had seen just about everything GMC had to offer. Was a fanboi when young. Stationary engines and ginormous trucks are probably about the only thing you could use one for. The 702 probably exceeds that number in pounds. That’s not so bad, for a truck engine. The V6 was a fairly compact engine to start with, and had to be light enough to work in even the smallest pickups. So which transmissions actually bolt to this monstrosity? 6L90E? Hope that’s an Allison Automatic cause I’d be frightened to have a trans that could handle all that torque. The trans only has to handle more than the tyres I suppose! the CTS-V has 630 lb-ft of torque, and not at a mere 1600 RPMs either. They show a DIS setup on the mill with the 4L80. That’s pretty cool! 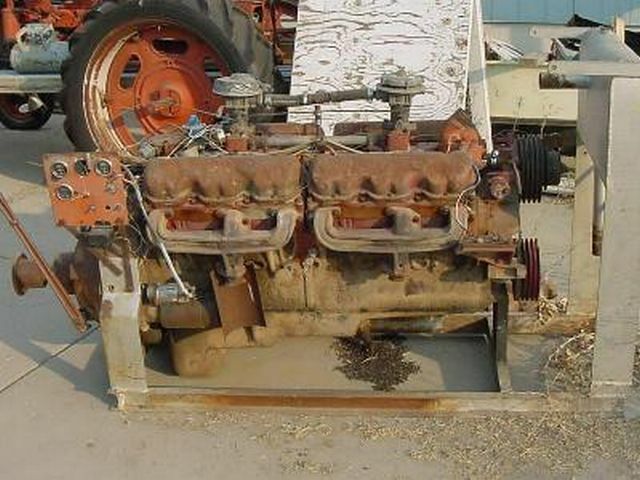 There was a Detroit Diesel V-12 from what I recall, not related to this motor, but it was available in GMC rigs, as well as others. That would be the Detroit “Buzzin Dozen” 12V-71 at 14L. It also had a bigger 18.6L 16 Cyl version that will likely be the biggest motor that ever went into a on road truck. Perfect for a half ton with tall gearing love the sound of the stocker thru open pipes. I am getting a real education on this site. I had never heard of this engine either. I also am curious as to the transmission availability. A nice write up as usual. Blastolene does some seriously neat stuff. That B702 is stunning. Piss’d Pete will always be my favorite though. An engine choice as unusual as a Twin Six needs to be out in the open. Preferably with a Hilborn style FI system, 12 V stacks and 4 plaid valve covers would be a heck of a sight in a roadster of some type. Reproduce the block and heads in lightweight aluminum, with revised port design in the heads, and four-bolt mains and a premium forged crank in the bottom end. Could or has the “twin 6” ever been caste in aluminum ? Lovely sounds! It reminds me of Dad’s Chris Craft with twin 327s (bored out to 350s). A cool engine I didn’t know existed. May the scrapyard yield me one of these. Tomorrow morning can’t come soon enough… Why couldn’t I just collect STAMPS?! L.A.P.D. Air Support used to have a GINORMOUS tanker truck with one of these engines , even fully loaded it went like stink . I wonder if one of those could be made to fit in a half-ton pickup? As a new hire at GM Truck and Coach in 1967 I remember seeing several crate 702 engines. Local 702 powered gravel haulers pulling (off the record) 90,000+ GCW held their own with the Detroits. I was working for a GMC dealer in Tennessee in the later 70’s. Kroger Co. had a Cracker box day cab with a v12 engine. 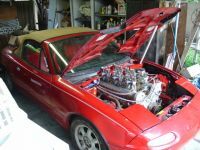 Get this it was to 351 engines that were bolted flywheel to crank damper! i saw it, it was real. Trucking Co.’s loved them; they’d go 400-500,000 miles. A well tuned one would do 4 mpg. but gas was 40-50 cents a gal! GM quit making them in 1965 but, by popular demand, tooled up again to make a bunch more for Canadian Trucking Co.’s. in 1966. My father had two of these v12 in 1962 and 1965. They were single axle and were a lot too loaded for the capacity of the axle .They were very efficient for that time.The power was equivalent of 250 Cummins and maybe a little more . Kingsway Transport had a lot of them to do Montreal-Toronto run.Drivers like it and in 1966 the company change for diesel 8V71 drivers ask for their old V12 trucks.Is there some of this old truck with V12 engine somewhere? Cheryldidsbury,Do you still have this engine? And are you in Didsbury Ab? Do you still have 702 from firetruck? Call me naïve, but isn’t that what a V12 engine is, two 6 cylinder engines engineered together to make one engine? More or less. The cylinder banks can be at nearly any angle although the best is 60 degrees I think. I should clarify. A V12 can be thought of as two inline 6 cylinder engines. An inline 6 is (or should be) a smooth running engine. To make a V12 requires a completely different block. Dynamically, the V12 is not much like two inline 6’s but much more like two V6’s. A 60 degree separation in the banks is ideal for a V6 and is also ideal for a V12, since dynamically, it is simply two V6’s running together. I think it is probably less common than a V12 that was designed from scratch to be a V12. Having the separate V6 cylinder heads is unusual, I can’t think off-hand of any other V12s that wouldn’t have just the normal two heads. For example the Aston Martin V12 was effectively two Ford V6 engines, but the major castings were unique. The only other one I can think of is the BMW V12 engine that ran a separate ECU for each cylinder bank. Does anyone know if the cylinder heads were the same as their normal inline sixes? No, not usually. Most V12’s are designed and engineered from scratch to be V12 engines. But some exceptions exist, like this one? Just like most V8s aren’t two four cylinders engineered together, although in some case that was the case too. And in some case, the reverse was done. Lots of ways to end up with a given engine design. The Bugatti Veyron WR16 engine is essentially four VW Polo four cylinder engines (with a few changes along the way). There are many ways to re-use a given engine architecture in new ways. Marine applications? I am guessing a few a least. Must have missed this the first time around. Very interesting, I had no idea it existed, thanks Paul! The GMC 60degree V6 was briefly offered as an optional upgrade in GMC pickups and suburbans in the late 1960s…I think(possibly early 70s)…that is what my memory is telling me right now. In a previous thread here on CC, I listed the GMC 60degree V6 as one of my best engines of all time. 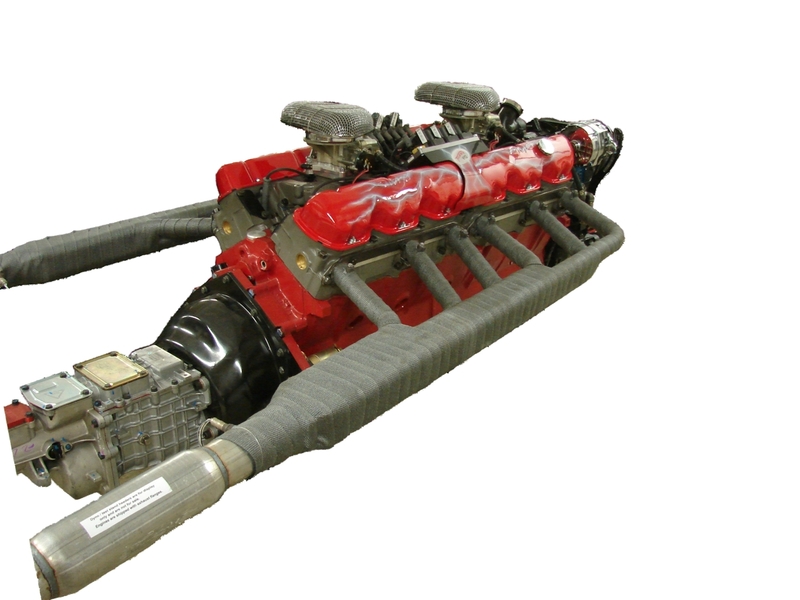 Ford also made a very large low stress gasoline engine for heavy duty trucks. It was a 534 V8 engine, I think. I did miss that one. Never saw it! Your idea was reverse engineered. 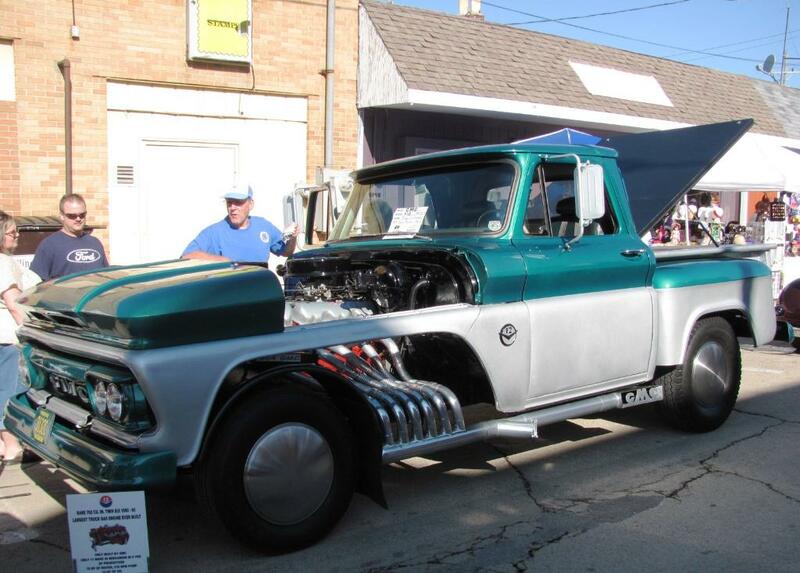 Starting in ’64, the Chevy inline six was offered as a cost reducing option in the 1/2 ton pickup. Good article. I’ll have to ask my father-in-law (retired trucker and GMC fan) if he ever had one of these under the hood. LIke JPC mentioned in the first comment, I, too have an irrational love for anything V12. And to see one of such huge displacement is very cool; the only other large V12 that I knew of was the Lycoming V12 designed for the big Auburns of the 30’s but ending up, in slightly altered form, in so many American LaFrance fire trucks well into the 60’s. These are indeed quite unusual with the 4 V6 cylinder heads–I wonder if that has ever been done on another production motor? 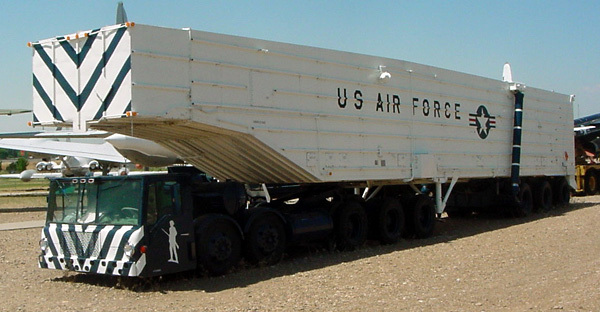 No mention of the Twin Six would be complete without the Minuteman Transporter-Erector used to move Minuteman ICBMs in and out of their silos for maintenance. The original V12-powered units (built jointly by Boeing and GMC – the cab interior was straight out of a Crackerbox) were in use until the early 1990s…. Common misconception was the 702 was two 351’s bolted together, but it wasn’t. 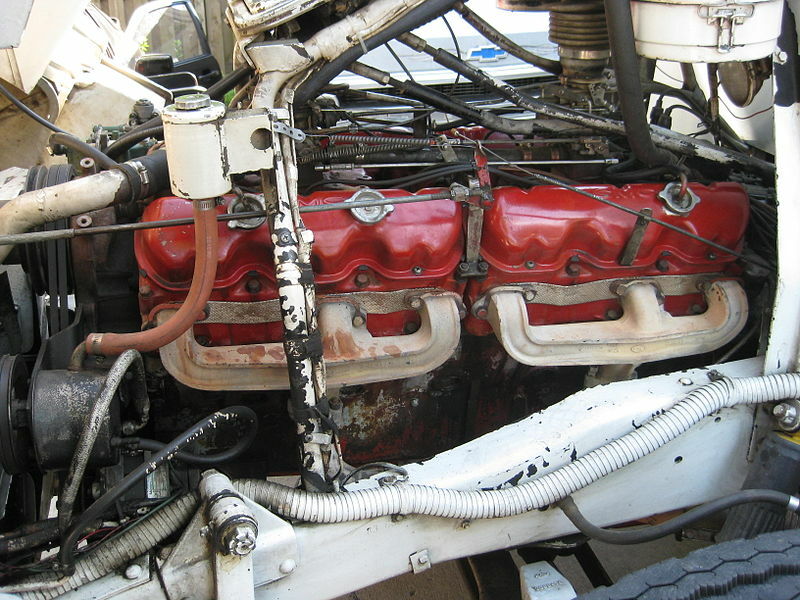 The ‘Twin-Six’ had a one piece block, crank, and camshaft, though it did use two intake manifolds, four heads, and four exhaust manifolds from the 351. 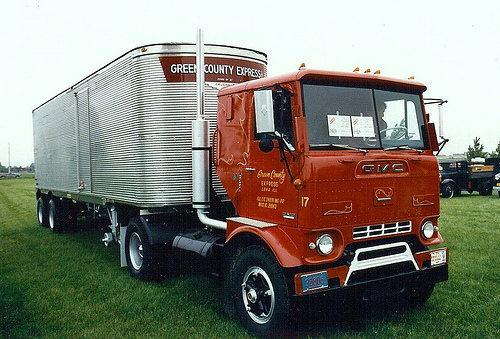 The 702 was primarily offered in the GMC ‘B’ series short conventional and ‘L’ series steel tilt cab, but was not regular production in the ‘Crackerbox’ aluminum tilt. Many of the 702’s went into fire apparatus chassis, and they were indeed somewhat popular in Canada. The 702 was replaced by a 637 cube V-8 (also a member of the GMC V-6 family) in 1966. The 637 was available in a wider variety of trucks due to it’s shorter length, and it was somewhat lighter. The gasoline 637 had some interesting design similarities to the Toroflow diesels, which was not much of a surprise considering there was a 637 V-8 Toroflow diesel as well.